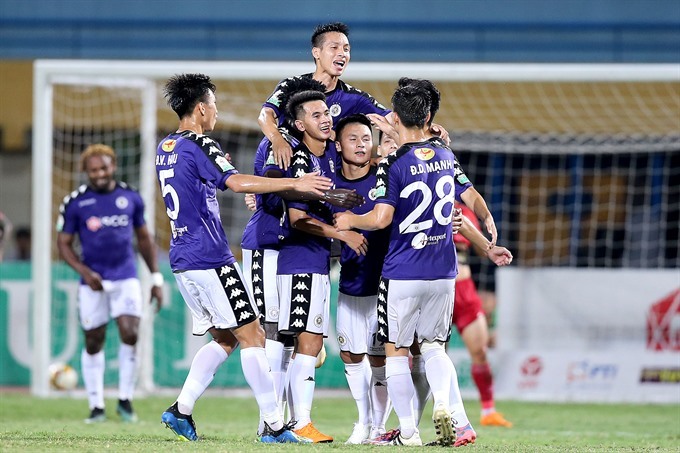 HÀ NỘI — V.League 1 champions Hà Nội FC will play Thai League runners-up Bangkok United in the first qualification match of the AFC Champions League tonight in Bangkok. The team left for the match on Sunday with all of their best players, including new signing national goalkeeper Bùi Tiến Dũng and former Guam midfielder Brandon McDonald. Victory would be a first step to securing a berth in the final round of the continent’s top tournament. “This target shows our big ambition to access the higher-level competition. It is not easy as we can see the poor results of Vietnamese clubs when participating here in the past. However, we are given a target we will do our best,” said head coach Chu Đình Nghiêm. Vietnamese clubs have historically struggled in Asia’s premier competition, with Becamex Bình Dương’s single win in the group stage in 2016 the best any local side has managed. To prepare properly, Nghiêm and his team just enjoyed the Lunar New Year celebrations for two days and returned to training last Wednesday. He will bring his strongest side, including eight national team players, to Bangkok. This is the fifth year the team have entered the qualifiers of the contest. They have yet to advance to the group phase of the competition, slipping out in the playoffs in 2014, 2015 2016 and 2017. They have been one of three strongest teams in the Thai League under Brazilian coach Alexandre Polking since 2014. Bangkok United will make their third appearance in the AFC Champions League and their second in three seasons after last featuring in the qualifying rounds in 2017. The match will be at the Thammasat Stadium, Pathum Thani from 7pm local time. If they win, Hà Nội will next meet Shandong Luneng of China in the second qualifier on February 19. But if they lose they will drop to the AFC Cup’s Group F where they will face Naga World (Cambodia), Tampines Rovers (Singapore) and Yangon United (Myanmar) starting on February 26. — VNS.